(1) ‘What is meant by statement that man was made “in the image of God”? Col 3:10; Eph. 4:24 declare that this “image” consists in “righteousness, knowledge, and holiness of truth.” By that is meant that the image of God in man consisted in intellectual and moral likeness rather than physical resemblance. Some think that 1 Thess. 5:23 indicates that the “trinity of man”--body, soul, and spirit--constitutes that image and likeness. (2) What is meant by the anthropomorphic expressions used of God? For example: God is said to have hands, feet, arms, eyes, ears; He sees, feels, hears, walks, etc. Such expressions are to be understood only in the sense of being human expressions used in order to bring the infinite within the comprehension of the finite. How otherwise could we understand God saving by means of human expressions, in figures that we all can understand! (3) How are such passages as Exod. 24:10 and 33:18-23 in which it is distinctly stated that men saw the God of Israel, to be reconciled with such passages as John 1:18; “No man hath seen God at any time,” and Exod. 33:20: “There shall no man see me and live”? in the Old Testament: Gen 16:7, 10, 13. Note here how the Angel of the Lord is identified with Jehovah Himself, cf. vv. 10, 13. Also Gen. 22:12—“The angel of the Lord.... not withheld from me.” In 18:1-16, one of the three angels clearly and definitely identifies himself with Jehovah. Compare chapter 19, where it is seen that only two of the angels have come to Sodom; the other has remained behind. “Who was this one, this remaining angel? Gen.18:17, 20 answers the question; v. 22 reads: “And Abraham stood yet before the Lord. In Exod. 13:21 it is Jehovah, while in 14:19 it is the Angel that went before Israel. Thus was the way prepared for the incarnation, for the Angel of the Lord in the Old Testament is undoubtedly the second person of the Trinity. This seems evident from Judges 13:18 compared with Isa. 9:6, in both of which passages, clearly referring to Christ, the name “Wonderful” occurs. Also the omission of the definite article “the” from before the expression “the Angel of the Lord,” and the substitution of “an” points to the same truth. This change is made in the Revised Version. cc) What was it then that the elders of Israel saw when it is said they saw the “God of Israel”? Certainly it was not God in His real essence, God as He is in Himself, for no man can have that vision and live. John 1:18 is clear on that point: “No man hath seen God at any time.” The emphasis in this verse is on the word “God,” and may read, “GOD no one has seen at any time.” In 5:37 Jesus says: “Ye have neither heard his voice at any time, nor seen his shape.” From this it seems clear that the “seeing” here, the which has been the privilege of no man, refers to the essence rather than to the person of God, if such a distinction can really be made. This is apparent also from the omission of the definite article before God, as well as from the position of God in the sentence. None but the Son has really seen God as God, as He really is. What, then, did these men see? We face the challenging circumstance that many voices in the discussion know nothing of Christian hymnody prior to the nineteenth or twentieth century (which is precisely the moment when some of us think it began a downward spiral). They often equate traditional with organ-accompanied hymns, for instance, even though organs were uncommon in the Protestant tradition (both because of expense and because of musical and theological considerations) until the mid-to-late nineteenth century. Thus, a young person reared in anything like a typical evangelical church knows only two things: nineteenth-century, sentimentalist revivalist hymns, and contemporary praise choruses; and they think the argument against the latter is an argument for the former. 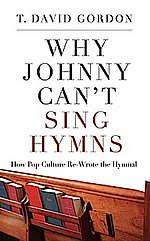 By these criteria, only the most artistically gifted (or arrogant) of generations could possibly imagine that it could, in a single generation, be expected to produce a body of hymns that surpassed all previous hymns and rendered them obsolete. If church leaders try to establish a style of worship based upon their preferences or based upon satisfying congregants' competing preferences, then the church will inevitably be torn apart by the politics of preference. But if the leadership is asking the missional questions of “Who is here?” and “Who should be here?” in determining worship styles and practices, then the mission of the church will enable those leaders to unite around gospel goals that are more defensible and uniting than anyone’s personal preference. These gospel goals will never undermine the gospel contours of the worship service, but rather will ask how each gospel aspect can be expressed in ways that best minister to those present and those being reached for Christ’s glory. Corporate Worship, by Terry Lange Jr.